American National Standard Institute (ANSI) standard # 40, # 50, # 60 A Plate sprockets are provided as a flat plate with no hub. 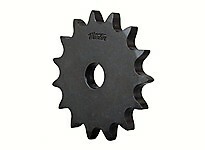 This enables you to drill and mount the sprocket your machine without having a hub. All A plate sprockets have a plain bore with no keyway or set screws.